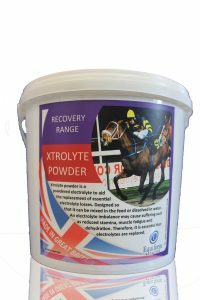 A comprehensive powdered electrolyte designed specifically for Racehorses working at maximal levels in hot and humid environments. The formulation contains the key electrolytes normally lost in sweat, included at levels to help maintain the vital fluid balance within the body. 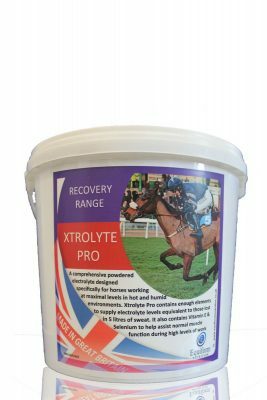 Xtrolyte Pro contains enough elements to supply electrolyte levels equivalent to those lost in 5 litres of sweat. It also contains Vitamin E & Selenium to help assist normal muscle function during high levels of work. 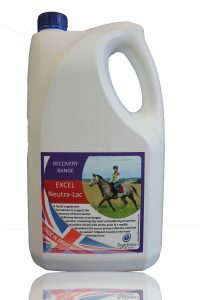 Some horses find the salty nature of this product unpleasant, to ensure the horse does not go off his feed it is recommended that the product is introduced slowly and the daily dose added to every feed, rather than just one. 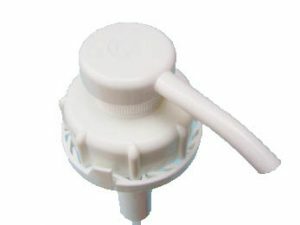 It also may be of benefit to dampen the feed thus preventing the larger granules of salts falling to the bottom of the feed bucket.